Watch Facebook COO Sheryl Sandberg's TEDTalk above and then explore her thoughts in this companion essay. When Pat Mitchell invited me to speak at TEDWomen, everyone assumed I would talk about social media. I assumed so too. But as I started pulling together my thoughts, I landed on another topic: "Why We Have Too Few Women Leaders." Because for all the ceilings that have been shattered, we still have a real problem. Women became 50 percent of the college graduates in the United States in 1981. Since then, we have slowly and steadily made progress, earning increasingly more of the college degrees, taking more of the entry-level jobs, going into previously male-dominated fields, moving up each step of the ladder. But there is one big exception to this improvement -- the top jobs. Thirty years later, we have not come close to holding our proportional share of positions of power in any industry. More alarmingly, the numbers at the top are no longer improving. In the 2008 election, women lost seats in Congress for the first time in three decades. Across the corporate sector, women have held 15 to 16 percent of the C-level jobs and Board seats since 2002. Globally, only nine of 190 countries are led by women. So even as people worry about boys falling behind girls in education and write articles with headlines like "The End of Men," we have to acknowledge that men still run the world. Our revolution has stalled. Women still face many external and institutional barriers, but I wanted to use my time on the TED stage to focus on what we can do as individuals to help change these percentages. So I offered three messages to women who want to stay in the workforce: (1) Sit at the table -- have the confidence to reach for opportunities; (2) Make your partner a real partner -- share responsibilities at home so you and your partner can both pursue careers; and (3) Don't leave before you leave -- challenge yourself at work so that when you have a decision to make, there are compelling reasons to stay or come back. I also acknowledged the difficulty between choosing time at home and at work. We need to respect and support all choices just as we need to emphasize the importance that they be made thoughtfully. Right before I went on stage, I asked Pat if I should publicly admit that my preschool daughter was clinging to my leg the day I left to give this talk. "Absolutely tell that story," said Pat. "Other women go through this and you have to be out there and sharing this." Thanks to the power and reach of the TED conference, the response to the talk has been truly encouraging. Women forwarded the link to their colleagues, friends, roommates and daughters. I received emails from women of all ages, sharing stories of their fears and their triumphs. Last week, I received one from Sabeen Virani, a consultant for a Dubai-based strategy consulting firm, who was working in Saudi Arabia where she was the only woman in an office of 300 employees. My talk includes a story about a male executive who did not know where the women's restroom was in his own office. 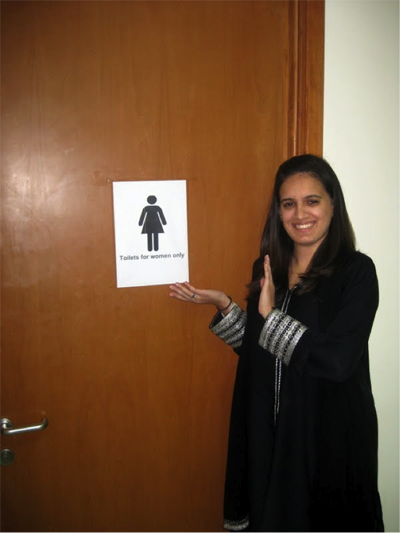 The issue for Sabeen, she wrote, was not that no one knew where the women's restroom was, but that it did not exist at all. Inspired by the talk, she worked hard to earn the respect of her client and gained the courage to ask for her own bathroom. She sent me a photo of her smiling in front of a door with a printed paper sign that reads simply and powerfully, "Toilets for women only." Long before Sheryl Sandberg left Google to join Facebook as its Chief Operating Officer in 2008, she was a fan. Today she manages Facebook's sales, marketing, business development, human resources, public policy and communications. It's a massive job, but one well suited to Sandberg, who not only built and managed Google's successful online sales and operations program but also served as an economist for the World Bank and Chief of Staff at the US Treasury Department. Sandberg's experience navigating the complex and socially sensitive world of international economics has proven useful as she and Facebook founder Mark Zuckerberg work to strike a balance between helping Facebook users control privacy while finding ways to monetize its most valuable asset: data.